The L’Aquàrium de Barcelona or the Aquarium Barcelona is a very popular attraction that is located in the Port Vell harbor area of the city. There are many tanks that are home to over 11,000 animals which represent 450 species. The aquarium also has an 262 foot underwater tunnel where sharks can be viewed. The Aquarium Barcelona opened to the public in 1995. 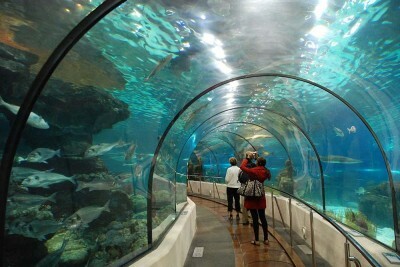 It is the largest aquarium in Europe, and has twenty massive tanks where various kinds of sea life can be seen. Over 8,000 fish live in these tanks which contain millions of liters of ocean water. The Aquarium Barcelona has a variety of thematic areas. One area exhibits the tropical waters of Hawaii, the Great Barrier Reef and the Red Sea. The aquarium puts a large emphasis on the Mediterranean Sea area and has ten tanks that replicate different habitats. The first area in the aquarium displays life that is close to the shore. Many flat fish, octopuses, and colorful morays can be seen in this exhibit. Sea horses, dogfish, as well as red star fish are also on display. There are several tanks that exhibit sea life that is found in the deeper areas of the ocean. The main attraction for many is the Oceanarium. This is a massive round tank that is filled with over four million liters of sea water. Here visitors can view many of the larger species that reside in the Mediterranean Sea, such as the ocean sunfish, sand tiger sharks and rays. This area has a slow moving sidewalk that runs the entire length of the tunnel which offers visitors very close up views of diverse sea life. Planeta Aqua is a very interesting exhibit that shows how different creatures can adapt themselves to ocean life in some very severe conditions. Here visitors are shown how animals live in arctic water and the darker, deep areas of the ocean. Additionally, there is an open tank that contains rays, an area that has piranhas, and an exhibit of water spitting archerfish. Different types of penguins can also be seen in this area of the Aquarium Barcelona.